Den här artikeln handlar om den första dagen i invasionen av Normandie (Dagen D). De efterföljande operationerna finns i Invasionen av Normandie. "Dagen D" och "D-dagen" hänvisar hit. För den militära termen, se Dagen D (term). Amerikanska soldater vadar i land på Omaha Beach under landstigningen, 6 juni 1944. Totala allierade förluster (döda, skadade, saknade eller tillfångatagna) beräknas till ungefär 10 000. Landstigningen i Normandie, kodnamn Operation Neptune, var etableringen av ett brohuvud under de allierades invasion av Normandie, även känd som Operation Overlord, under andra världskriget. Landstigningarna inleddes tisdagen den 6 juni 1944 (Dagen D), med början klockan 06:30. I planeringen var Dagen D den term som används för dagen av de faktiska landstigningarna som var beroende av slutligt godkännande. Anfallet genomfördes i två faser; en luftburen attack som landsatte 24 000 brittiska, amerikanska, kanadensiska och fria franska luftburna trupper strax efter midnatt, och en amfibisk landstigning med allierat infanteri och pansardivisioner på Frankrikes kust som började klockan 06:30. Själva landstingningsfasen under Operation Overlord kallades Operation Neptune. Operationer i avseende som lockbete verkställdes också kodnamn Operation Glimmer och Operation Taxable för att distrahera de tyska styrkorna från den verkliga landningszonen. Operationen var den största amfibiska invasionen i världshistorien, med över 160 000 soldater som landsteg den 6 juni 1944. 195 700 allierade sjömän och personal ur handelsflottan på över 5 000 fartyg var inblandade. Invasionen krävde transport av soldater och material från Storbritannien av trupplastade flygplan och fartyg, landstigningsfartygen, flygunderstöd, militära förbud av Engelska kanalen och marint artilleriunderstöd. Landstigningarna ägde rum längs en 80 km lång sträcka av Normandies kust indelad i fem sektorer: Utah, Omaha, Gold, Juno och Sword. ^ Ford & Zaloga 2009, s. 342. ^ [a b c] Ford & Zaloga 2009, s. 25. ^ [a b c] Beevor 2009, s. 82. ^ Beevor 2009, s. 492. ^ [a b] Beevor 2009, s. 76. ^ [a b] Williams 1988, s. x. ^ Ford & Zaloga 2009, s. 7. ^ Ellis, Allen & Warhurst 2004, ss. 521–533. ^ Ford & Zaloga 2009, ss. 60, 63, 118–120. ^ ”Frequently Asked Questions for D-Day and the Battle of Normandy (casualties)” (på engelska). Ddaymuseum.co.uk. Arkiverad från originalet den 21 juni 2013. https://www.webcitation.org/6HXB6Mar3?url=http://www.ddaymuseum.co.uk/d-day/d-day-and-the-battle-of-normandy-your-questions-answered#casualties. Läst 6 juni 2009. ^ ”The Landings in Normandy — Veterans Affairs Canada” (på engelska). Vac-acc.gc.ca. http://www.vac-acc.gc.ca/remembers/sub.cfm?source=history/secondwar/canada2/normandy. Läst 6 juni 2009. ^ ”Arkiverade kopian”. Arkiverad från originalet den 21 juni 2013. https://www.webcitation.org/6HXB6Mar3?url=http://www.ddaymuseum.co.uk/d-day/d-day-and-the-battle-of-normandy-your-questions-answered. Läst 6 juni 2009. ^ [a b] ”D-Day June 6, 1944” (på engelska). Army.mil. 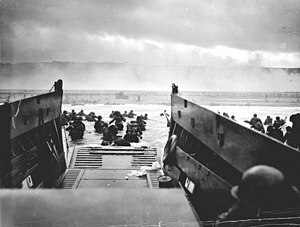 http://www.army.mil/d-day/. Läst 14 maj 2009. Ambrose, Stephen (1994) . D-Day June 6, 1944: The Climactic Battle of World War II. New York: Simon & Schuster. ISBN 978-0-671-67334-5. Beevor, Antony (2009). D-Day: The Battle for Normandy. New York; Toronto: Viking. ISBN 978-0-670-02119-2. Bickers, Richard Townshend (1994). Air War Normandy. London: Leo Cooper. ISBN 0-85052-412-1. Brown, Anthony Cave (2007) . Bodyguard of Lies: The Extraordinary True Story Behind D-Day. Guilford, CT: Globe Pequot. ISBN 978-1-59921-383-5. ”Bruinsburg Crossing (April 30 – May 1)”. Bruinsburg Crossing (April 30 – May 1). National Park Service. http://www.nps.gov/vick/historyculture/bruincross.htm. Churchill, Winston (1949). Their Finest Hour. The Second World War. "II". Boston; Toronto: Houghton Mifflin. OCLC 396145. Churchill, Winston (1951) . Closing the Ring. The Second World War. "V". Boston: Houghton Mifflin. OCLC 396150. Corta, Henry (1952) (på French). Les bérets rouges. Paris: Amicale des anciens parachutistes SAS. OCLC 8226637. Corta, Henry (1997) (på French). Qui ose gagne. Vincennes, France: Service Historique de l'Armée de Terre. ISBN 978-2-86323-103-6. ”D-Day and the Battle of Normandy: Your Questions Answered”. D-Day and the Battle of Normandy: Your Questions Answered. Portsmouth Museum Services. http://www.ddaymuseum.co.uk/faq.htm. Ellis, L.F.; Allen, G.R.G. ; Warhurst, A.E. (2004) . Butler, J.R.M. red. Victory in the West, Volume I: The Battle of Normandy. History of the Second World War United Kingdom Military Series. London: Naval & Military Press. ISBN 1-84574-058-0. Escott, Beryl E. (2010). The Heroines of SOE: Britain's Secret Women in France. Stroud, Gloucestershire: History Press. ISBN 978-0-7524-5661-4. Ford, Ken; Zaloga, Steven J. (2009). Overlord: The D-Day Landings. Oxford; New York: Osprey. ISBN 978-1-84603-424-4. Gilbert, Martin (1989). The Second World War: A Complete History. New York: H. Holt. ISBN 978-0-8050-1788-5. Goldstein, Donald M.; Dillon, Katherine V.; Wenger, J. Michael (1994). D-Day: The Story and Photographs. McLean, Virginia: Brassey's. ISBN 0-02-881057-0. Holland, James (5 juni 2014). ”D-Day: Exploding the myths of the Normandy landings”. CNN. http://edition.cnn.com/2014/06/05/opinion/opinion-d-day-myth-reality/. Hooton, Edward (1999) . Eagle in Flames: The Fall of the Luftwaffe. London: Arms and Armour. ISBN 1-86019-995-X. Horn, Bernd (2010). Men of Steel: Canadian Paratroopers in Normandy, 1944. Toronto: Dundurn Press. ISBN 978-1-55488-708-8. Murray, Williamson (1983). Strategy for Defeat: The Luftwaffe, 1933–45. Washington: Brassey's. ISBN 1-57488-125-6. ”Pegasus Bridge: The Bridge of the Longest Day”. Pegasus Bridge: The Bridge of the Longest Day. Mémorial Pegasus D-Day Commemoration Committee. Arkiverad från originalet den 2014-04-07. https://web.archive.org/web/20140407203611/http://www.memorial-pegasus.org/mmp/pont_benouville/index.php?lang=uk. Läst 30 november 2014. Special Operations Research Office, Counter-insurgency Information Analysis Center, United States Army (1965). A Study of Rear Area Security Measures. Washington: American University. Staff (5 juni 2014). ”D-Day: In the words of the BBC journalists”. D-Day: In the words of the BBC journalists. BBC News. http://www.bbc.com/news/magazine-27715250. Stanley, Peter (6 juni 2004). ”Australians and D-Day”. Anniversary talks. Australian War Memorial. http://www.awm.gov.au/education/talks/australians-and-dday/. US Department of the Navy, Naval History and Heritage Command. ”D-Day, the Normandy Invasion, 6 – 25 June 1944”. Frequently asked questions. http://www.history.navy.mil/faqs/faq109-1.htm. Weigley, Russell F. (1981). Eisenhower's Lieutenants: The Campaign of France and Germany 1944–1945. "I". Bloomington, Indiana: Indiana University Press. ISBN 978-0-253-13333-5. Weinberg, Gerhard (1995) . A World At Arms: A Global History of World War II. Cambridge: Cambridge University Press. ISBN 978-0-521-55879-2. Wenande, Christian (4 juni 2014). ”Denmark finally recognised as D-Day ally”. Copenhagen Post. Ejvind Sandal. http://cphpost.dk/news/denmark-finally-recognised-as-d-day-ally.9770.html. Whitmarsh, Andrew (2009). D-Day in Photographs. Stroud: History Press. ISBN 978-0-7524-5095-7. Williams, Jeffery (1988). The Long Left Flank: The Hard Fought Way to the Reich, 1944–1945. Toronto: Stoddart. ISBN 0-7737-2194-0. Wilmot, Chester (1997) . The Struggle For Europe. Ware, Hertfordshire: Wordsworth Editions. ISBN 1-85326-677-9. Yung, Christopher D. (2006). Gators of Neptune: Naval Amphibious Planning for the Normandy Invasion. Annapolis: Naval Institute Press. ISBN 1-59114-997-5. Zuehlke, Mark (2004). Juno Beach: Canada's D-Day Victory: June 6, 1944. Vancouver: Douglas & McIntyre. ISBN 1-55365-050-6. Badsey, Stephen (1990). Normandy 1944: Allied Landings and Breakout. Osprey Campaign Series. "1". Botley, Oxford: Osprey. ISBN 978-0-85045-921-0. D'Este, Carlo (1983). Decision in Normandy: The Unwritten Story of Montgomery and the Allied Campaign. London: William Collins Sons. ISBN 0-00-217056-6. Holderfield, Randal J.; Varhola, Michael J. (2001). The Invasion of Normandy, June 6, 1944. Mason City, Iowa: Savas. ISBN 1-882810-45-7. Keegan, John (1994). Six Armies in Normandy: From D-Day to the Liberation of Paris. New York: Penguin Books. ISBN 0-14-023542-6. Neillands, Robin (2002). The Battle of Normandy, 1944. London: Cassell. ISBN 0-304-35837-1. Ryan, Cornelius (1959). Den längsta dagen. New York: Simon & Schuster. ISBN 0-671-20814-4. Stacey, C.P. (1946). Canada's Battle in Normandy: The Canadian Army's Share in the Operations, 6 June – 1 September 1944. Ottawa: King's Printer. OCLC 39263107. Stacey, C.P. (1960) (PDF). Volume III. The Victory Campaign, The Operations in North-West Europe 1944–1945. Official History of the Canadian Army in the Second World War. Ottawa: Department of National Defence. http://www.cmp-cpm.forces.gc.ca/dhh-dhp/his/docs/Victory_e.pdf. Tute, Warren; Costello, John; Hughes, Terry (1975). D-Day. London: Pan Books. ISBN 0-330-24418-3. Whitlock, Flint (2004). The Fighting First: The Untold Story of The Big Red One on D-Day. Boulder: Westview Press. ISBN 0-8133-4218-X. Zetterling, Niklas (2000). Normandy 1944: German Military Organisation, Combat Power and Organizational Effectiveness. Winnipeg: J. J. Fedorowicz. ISBN 0-921991-56-8. Sidan redigerades senast den 29 mars 2019 kl. 09.44.